I'd offer you some of my cake (although, it is a good thing you are not really here, because the cake is... gone!) You would have to listen to me babble on and on about how I got to making this cake in the first place, and that it was supposed to be pumpkin cupcakes with cinnamon cream cheese frosting... and how Publix hasn't received their pumpkin yet. Thanks to Corinne, and my dear husband who happened to buy apples this week, I was still able to create a touch of fall here in still-very-warm-and-muggy Florida. I could tell you that the cake is supposed to look like this... but you can tell from Corinne's version that is isn't. Oh well, she & I texted and laughed over it for a bit... and her recommendation to make the glaze really thick was brilliant! But I got carried away with the almond extract. Oh, you noticed my necklace? I love having Africa in arms reach, and just over my heart, which is still overflowing with my journey. I want to tell you more about it... and how I really bought two, but I need to save that story for another day... when the emotions won't totally overwhelm me. What I can tell you is that by purchasing the necklaces, I supported Kristen's new project, Love Mercy. She & I have both been touched by Africa... and God has called her to do something big. She & her family have started a maternity home in Kenya (and part 2.) If your heart feels called to help, she has some really pretty things for sale, not all in the shape of my heart. I would tell you that this Marching Band season is already taking a toll on me- but through the exhaustion, I love it. Bring on the band, and the concession stand and the chaperoning and the making of healthy snacks. Oh, and the football. I guess you can tell where my passion is! Even as I am loving this year and trying not to wish it away, I am really looking forward to next year... when both Laura & Camden will march together! I really need to go to the grocery store. I'm pretty sure that I never made it last week, except to look for the pumpkin. My husband had picked up dinner stuff over the weekend, so on the nights we were actually home, we did cook and eat. But lunches? It was pretty slim pickin'. Laura usually heats up some rice or noodles and brings them to school, and Cam buys school lunch every day (ick)... but I like a really good lunch. At work, lunch is a big celebration, or as big as it can get with just four of us. But today it was pb&j for me... and I was surprised that it was actually quite tasty. If I don't make it to the store tonight, I guess I know what tomorrow's lunch will be. Amy, thank you for this time to chat and share... coffee with friends is such a nice way to spend the afternoon! I would love some of that cake, even if it looks "wrong," which means you will have to make more when I come for coffee . . . :) I love your necklace. the cake looks delicious! funny, i remember not being able to find pumpkin last year...i think they need to start making more of that, huh? i am fascinated by your visit to africa and can't wait to read more. what a lovely necklace. thanks so much for joining in for coffee this week! and those healthy snacks? Do they need more people to make them???? call me, I am available. I would love to help out with this. Can't wait till our 'not so' virtual lunch/breakfast this week. I'm loving that cake ... and the necklace is so unique. Can't wait to hear the story about it. 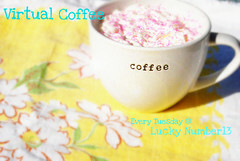 Would love to see you for Simple Pleasures on Thursday. I made it too and it did not come out looking as pretty as yours or Corinne's but it did taste good. and hubs said he especially liked the orange flavor of it. I would love to hear all about Africa. That cake looks delicious! Was it as good as it looks? Obviously...it's gone, right? Yummy!! Cake and coffee are 2 of my favorite things! I think it LOOKS deeeeelicious! I think that supporting orphans/mothers in Africa in any way is powerful! Praying! 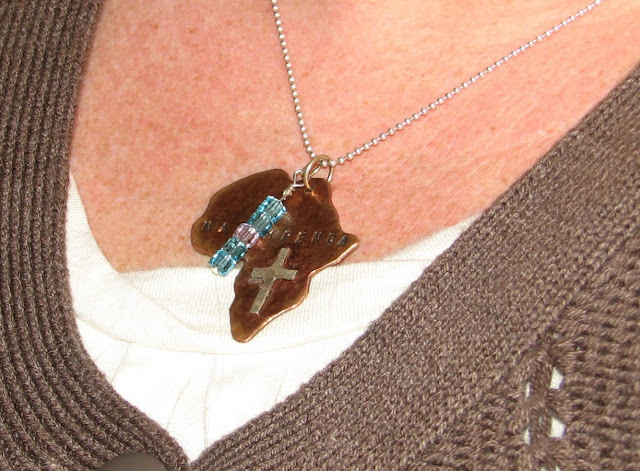 I love the necklace - perfect for you and your Africa heart! I've heard about Mercy House...but must stop by her blog to find out more.